I guess I can’t quite leave sharpening alone. About six months ago I switched to using a Naniwa Chosera 10,000 as my primary finishing stone. I had been using a Shapton 16,000 glass stone for this purpose and could have left well enough alone because it is an excellent stone. It’s fast, the grit is very consistent, it’s convenient because it requires no soaking, and it gives a great edge. However, the drawback for me has always been the lack of excellent tactile feedback from the blade on the stone surface. This is particularly important for freehand or semi-freehand finishing of the cambered edge of plane blades where the feel of the edge on the stone is critical. Even when using a honing guide for simple non-cambered edges, the delicate feedback near the end of honing is helpful and reassuring that the angle and edge are right. I had read reviews claiming the feel of sharpening on the Chosera 10K stone was outstanding and that is just what I have found. That’s the big difference and it really matters. Moreover, it cuts just as fast as the Shapton, maybe faster, but is practically more efficient because I have fewer do-overs. There is also no tendency for the blade to skip as on the fine Shapton. The Shapton is 16K and the Chosera 10K, so does this mean a step down in edge quality? Grit number is just one factor is producing edge quality. Others include the particle shape and how it fractures, the consistency of particle size, the density of the particles and how they present at the surface, and the properties of the binder. In practical shop use, the Chosera has been producing edges not one bit less sharp or otherwise of lesser quality than the Shapton. In fact, I think it’s better, if only because I can better feel those last whispery kisses of the sharp edge on the stone to get it just right. The minor downside of the Chosera is that it needs pre-soaking. Various recommendations can be found for this including that soaking is optional. I’ve found it needs 15 minutes. Less soaking, 5 or 10 minutes, makes the stone too quickly drink up the water you splash on when starting to sharpen. 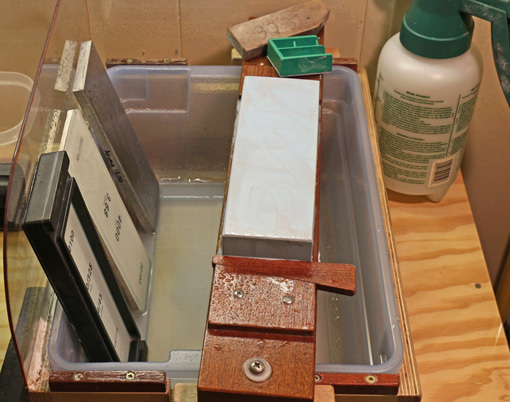 When finished sharpening, I flatten it while it is still wet with the Shapton diamond lapping plate. I still use a 1200 grit diamond stone as a nagura and remain convinced this enhances the action and feel of finishing stones including the Chosera 10K, as well as the quality of the finished edge. (More to come on this soon.) I did not find helpful the nagura that comes with the Chosera. This is an expensive stone but at more than one inch thick, it will last a long time. The bottom line is that it has made my sharpening more assured because of the excellent feel. Hmm.. Efficiency is all that matters. Sometimes grit number isn’t as important as the feel of sharpening. Thanks for review. Can you provide a source or two for the Naniwa Chosera 10,000 ? I got mine from Joel Moskowitz at toolsforworkingwood.com but I checked just now and they do not have it listed in stock. Maybe contact them. Stu Tierney at toolsfromjapan.com has them listed as available.